Li Chunyuan has two worlds – the real, and the fictional. His 'day job' is the deputy head of the environmental protection bureau in the Hebei city of Langfang, just 40 kilometres from Beijing. Li is responsible for fighting air pollution in Langfang, one of China’s smoggiest cities. And then there is also the fictional world he has created. In 2014 he published “Smog Is Coming”, an environmental novel in which all the characters are somehow linked to air pollution, be they government officials or ordinary people. The story depicts the disputes between political appointees and the exhaustion of ordinary people. For Li it was easy to build a fictional world in which he could trace smog back to its source, and this gave him an enormous sense of achievement. 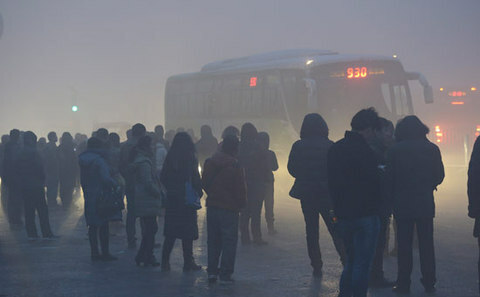 But in the real world, each step forward in the fight against smog requires all his effort and resources. Novels rely on conflict, and "Smog Is Coming" introduces it right at the start. In the novel, Lu is forced out by the county head, moving with his family from the county that thwarted him. Li says he carefully planned the fates of every character, some of whom have a clear sense of morality. The setbacks Lu faces are, he thinks, a realistic portrayal of the problems some environmental officials have to deal with. In Li’s novel all the environmental officials - both the young straight-talkers and the old hands – are dedicated and hard-working. This could be understood as part of his motive for writing the novel – to speak out for the good environmental officials, as well as to tell of his own troubles. But the satisfaction he gained from his fictional world does not relieve his real-life worries. Experience has told Li that, with the public now not at all hesitant to complain of pollution, environmental officials are very much in the firing line. Local bureau chiefs are replaced every two or three years. But some positions lie vacant for a long time – candidates prefer to take fewer prominent roles, or even accept a demotion, than work in environmental protection. Environmental officials also find themselves hitting a career ceiling - and some even say that bureau head is the end of the road. Li pulls out a copy of New Environment, an internal government publication, and points to some statistics. In the last 20 years, 99% of environmental bureau chiefs leaving their posts were not promoted. In the novel, once Lu is undermined by the county head, the local government struggles to find a replacement, much to the county head’s embarrassment. Lu’s three deputies are called in and told they will each take the job for one month – and whoever does best will keep the job. While one of the deputies, Ren Jing, is in the post, the county head plans to build a chemical plant on a plot of land by the county town. Ren is ordered to attend a meeting to rubber stamp the plans but pleads illness and sends a subordinate in his place. And then things get a bit farcical. Lu’s subordinate sends the doorman of the environmental bureau building to attend the meeting. At the meeting the only item on the agenda is for each department to sign off on the plans for the chemical plant and then make themselves scarce. The doorman, suited and booted and armed with his own official seal, does everything requested of him and within 30 minutes the deal is done. But three days later the city mayor makes an unexpected visit and finds that both the environmental bureau and the land bureau have stamped the official documents with the doorman's own seal. This is what many other officials often complain of: if they object to a project that local government leaders have decided to go ahead with, they are likely to be replaced or even disciplined. If they want to keep their jobs, they have to follow orders, to the detriment of the environment. Li admits that reality is richer than fiction, but he knows to watch his words. Those around him are often even more cautious. His colleagues often asked him whether he was things a bit far. And he took their advice, reining in the stories somewhat. Even so, he knows it will be hard to avoid giving offence, and he worries that people will assume the settings in the novel are based on real places. One similarity between his real world and his fictional one is that they both suffer from smog. 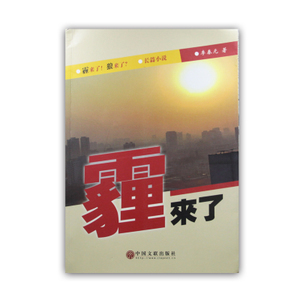 In 2012, Li’s fourth year as deputy bureau chief, PM2.5 pollution stopped being a bit of technical vocabulary and became a hot topic in public debate. Smog is the ever-present character, at work on every page, and reality provided no end of material for the author to use. Many of the scenes may sound exaggerated – for example a rash of burglaries in which the perpetrators were able to wear masks at night without arousing suspicion, as everyone was wearing them. But Li says he took his inspiration from reality – he had to investigate a theft from a factory, but when he checked the CCTV footage the thieves were wearing masks and the image was blurred by the smog. Li now plans to complete a trilogy. He is collecting more materials for his fictional world, and his next volume will be titled “Smog Confusion”, to describe some unprecedented changes in the environmental protection world. "whether he was things a bit far" should be "whether he was taking things a bit far"
Chen Xuan is a reporter at China Youth Daily.